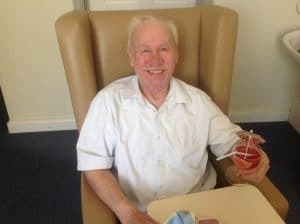 What a glorious summer we are having and with this heat we are focusing on hydration and keeping our residents cool and comfortable. We decided to make Wimbledon fortnight our Hydration Awareness fortnight to raise awareness of the importance of staying hydrated. Our staff had a refresher training session which looked at the reasons why elderly people can become dehydrated more quickly. 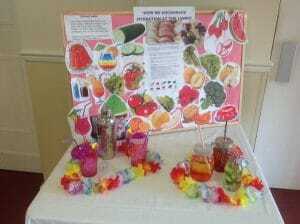 We also discussed ways to help keep our residents hydrated and made a display for our entrance lobby, so families were also aware. Why are the elderly more at risk of dehydration? You have decreased kidney function as you get older. Ageing is associated with a reduced sense of thirst, so you are naturally less inclined to drink. Water is stored in the body in muscle. As you age your muscle mass decreases so your body holds less water. If there is not enough water to expel waste products, the body will withdraw fluid from body tissues – which increases the risk of dehydration. Bladder control is weaker as you age. Some people deliberately drink less, so they don’t have accidents. Medications can affect water retention by the body. 1-2% loss of water: You feel thirst. But this is hard to detect with an elderly person as they have a reduced sense of thirst. 2-5% loss of water: Dry mouth, flushed skin, headache, fatigue and impaired physical performance. 6% loss of water: Increased body temperature, increased pulse rate and increased breathing. 8% loss of water: Dizziness, feeling weak. laboured breathing. Dizziness in the elderly means an increased risk of falls. 10% loss of water: Muscle spasms, swollen tongue, and delirium. 11% loss of water: Poor blood circulation and failing kidney function. The statistics make for scary reading, but staying hydrated is in fact very simple and can be very fun. Drink 6 to 8 glasses of water a day. Water is the fastest absorbed fluid but other drinks count (as long as they are not alcoholic!). 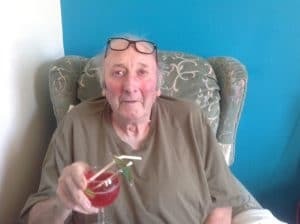 During Wimbledon fortnight we had a daily Mocktail Hour, with fun, fruity non-alcoholic drinks, themed each day, such as Cranberry Kiss and Saint Clements. All decorated with a parasol and straw and thoroughly enjoyed by our residents. Have a glass of water first thing in the morning and regular refreshment breaks during the day. Check out our Facebook page to watch Bob’s video on How to make a proper Brew. 4 teabags in the pot! This has had an amazing 525 views! Drink a full glass of water with medication. Eat lots of fruit and vegetables with a high water content. Our chef Anita made some delicious fruit sundaes with melon, pineapple, grapes and kiwi. 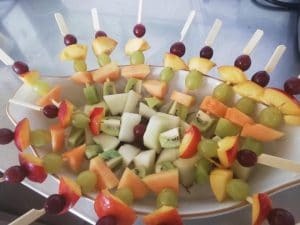 Clare, one of our carers, also suggested fruit kebabs, which were a hit all round. Also, lots of strawberry teas over Wimbledon. Take sips often from a drink container – make it more appealing with a straw, different temperatures, adding ice. We have had a lot of fun over the last few weeks, reinforcing our knowledge about hydration and have definitely shown that staying hydrated does not have to be boring!